Unique sneak peak into Iran-proxy terror group reveals its updated arsenal and experience, and its confidence next war will be different. Hezbollah sources cited in a unique speak peak into the Lebanese Iran-proxy terror group claim that they have gained powerful weapons and experience from the Syrian civil war, which will allow them to invade Israel in their third war against the Jewish state. The Foreign Policy article Thursday, entitled "Hezbollah's Death Valley," spoke about Hezbollah's involvement in Syria, where it is fighting to prop up Bashar al-Assad's regime on Iran's orders. It has lost many of its terrorists there, but sources in the group told the paper the fighting has only helped them. “In the next war, Hezbollah won’t stay on the borders, and the Israeli settlements in the north will not be protected from this," a source close to the terror group based in southern Lebanon told the paper, claiming Hezbollah now for the first time can infiltrate Israel in open war. The claims by Hezbollah sources come even as the Gulf Cooperation Council (GCC) on Wednesday declared the group a terrorist organization, citing Hezbollah's activity in the Gulf states recruiting terrorists and smuggling weapons - a point that was not raised in the article. Iran and Hezbollah both responded to the declaration with fury, apparently upset at how the move may impact the group. GCC's declaration came a week after Saudi Arabia halted a $3 billion program funding equipment for Lebanese security forces over the danger posed by Hezbollah. The Foreign Policy article also explored the arsenal of Hezbollah, noting that it has upgraded from the largely unguided missiles it fired in mass quantity on Israel in the 2006 Second Lebanon War. Analysts and sources close to the terror group say it now has "tactical ballistic missiles, Scud missiles, Fateh-110 Iranian missiles, and M-600 missiles, a Syrian modified version of the Fateh-110." Jeffrey White, a defense analyst at the Washington Institute for Near East Policy, told the paper that "now Hezbollah has the ability to strike guided munitions across Israel; they can hit targets inside Israel - including central and southern areas - with increased accuracy, including command posts, airfields, and major economic targets." According to White, Hezbollah also has advanced air-defense systems and Yakhont naval cruise missiles. "This is new. Ninety-five percent of the naval activity in 2006 was from the Israeli side, so in the next war the naval operations could look quite different," said White. Hezbollah sources were less willing to speaking about their arsenal, with one saying, "each war there are new surprises in terms of weapons, and we never reveal what we have until the time is ready." Many have argued that Hezbollah's longstanding involvement in Syria has kept it bogged down and stopped it from attacking Israel, but sources close to the terror group told Foreign Policy that Hezbollah has in fact improved its capabilities in Syria in preparation for its next war against the Jewish state. "Our fighters are getting training and experience through the work they are doing in Syria, and this is a great concern for the Israelis," said a Hezbollah source. "And our work there won’t distract us from the southern front against Israel." In Syria, Hezbollah is said to have developed a command-and-control structure, in addition to using drones for reconnaissance, and maintaining long supply lines. Thanks to that experience, the same Hezbollah source claimed that the Israelis "think we have the ability to not just invade villages in their north, but also stay and control the areas." Regional factors keeping the quiet? However it is still widely appraised that the terrorist organization will not launch an attack on Israel in the near future, largely because Lebanon is more politically divided, with many opposed to the Shi'ite terror group's actions in Syria and Lebanon. According to the Foreign Policy article, Hezbollah is facing a problem because those who oppose the group in Lebanon will not house those fleeing southern Lebanon if the terrorists start another war against Israel, and Syria cannot be used to house fleeing Lebanese as it was in 2006. 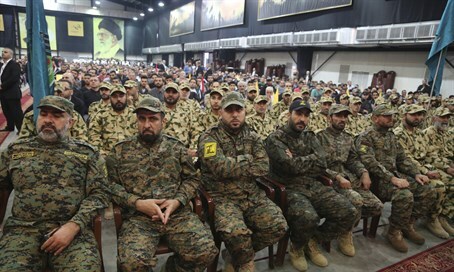 Randa Slim, an expert at the Middle East Institute, told the paper that the messy situation in Syria where Russia and Iran are also involved in addition to the US-led coalition is working to decrease the chances of Hezbollah attacking Israel. "The fact there are so many players in the mix creates more of a deterrent factor than a catalyst. Neither Russia nor Iran wants a war in the south with Israel right now," said Slim. For Israel's part it also would not want to drag in additional players in a war with Hezbollah and therefore would likely limit the focus of any conflict to Lebanon leaving Syria out of the picture, said Slim. "Today, you would have a multisided, multiparty war that could be extremely messy and complicated, with the possibility of a reshuffling of alliances. Israel wants to keep it clean, between Hezbollah and Israel, and therefore keep it within Lebanon," she said.